He was born in Priluk (Pryluky), Poltava district, Ukraine. In 1891 he made his way with his parents to the United States, and his family settled in San Francisco. He attended public school and later studied at Stanford University in California. In his student years he was influenced by socialist ideas and became a close friend of the American writer Jack London. In late 1896 he moved to New York and began to publish articles in Anglophone socialist publications, and he wrote in English a work entitled The Coming Socialist Struggle: Capitalist Contradictions Exposed, Socialism Defined (1897), 23 pp. Edlin then joined the Jewish socialists from the S.L.P. (Socialist Labor Party) and began writing for the daily socialist Dos abend-blat (The evening newspaper). In 1899 he became manager of Folks-tsaytung (People’s newspaper), which the “kangaroos” (a group that had split off from Daniel de Leon’s Socialist Labor Party) were publishing, after the de Leon supporters took control over Dos abend-blat. A bit thereafter, following the collapse of Folks-tsaytung, Edlin and the other “kangaroos”—B. Faygenboym, L. Budin, L. Kobrin, F. Krants, B. Vaynshteyn, A. Kaspe, Morris Hillquit, M. Girzhanski, and the Forverts (Forward) people, Morris Winchevsky and Ab. Cahan—founded the weekly Sotsyal-demokrat (Social democrat), and Edlin was the first editor of the newspaper (from October 7, 1900; after that it was edited by B. Faygenboym and ultimately by M. Zametkin; altogether it lasted eleven months). After the Sotsyal-demokrat went under, Edlin wrote for the Forverts; he was co-editor (1902-1903) and for a time also editor of the newspaper. Every Monday he published an article or a review in the section, “In der velt fun drama un muzik” (In the world of drama and music). In 1901 he was also editor of The Hamerville Social Democrat (?). Over the years 1903-1906, he edited the monthly Capmakers Journal (in Yiddish and in English) and co-edited as well Abendpost (Evening mail), the daily Herald (Herald), and Morgn-zhurnal (Morning journal, 1904-1913). At the same time he was one of the builders of the Workmen’s Circle and was secretary general of the organization (1913-1914). He was one of the fighters for educational work and Jewish cultural activities among the broad membership both by means of lecture tours and through publishing work. He was subsequently selected to serve as chairman of the Educational Committee which guided the cultural work in the organization. He soon became the centerpiece of a struggle between two sides, “young” and “old.” When the former in 1915-1916 had a majority in the executive of the Workmen’s Circle, Edlin became chairman. He played a significant part in the ideological quarrels concerning the role and goals of the Workmen’s Circle. After the founding of the daily newspaper Der tog (The day) in New York (1914), he became a member of the editorial board and over the course of the subsequent nine months the editor of the newspaper. In May 1925 he resigned from Tog and for a time was the American secretary of the Jewish National Fund, but he later returned to Tog. He also was much engaged with theater, and his two books had to do with the stage. The first book—Velt berimte operas (World famous operas) (New York: Hebrew Publishing Company, 1907), 208 pp.—is a collection of articles about the most popular Italian, French, and German operas, retelling their content and their critical estimations, with a short overview of the music and the opera in general. The second book was a play, written with L. Kuperman: Der id (The Jew), “a drama in four acts” (New York, 1911), 62 pp., published on a typewriter. On August 30, 1912 it was announced in the People’s Theater of Jacob Adler that they would be staging Edlin’s “Mentshn in keytn” (Men in chains), a family drama in four acts, and the role of “Lawyer Lunts” was to be played by Jacob Adler; however, the show was cancelled and the play was not staged. Edlin was the editor of the Yiddish translation of Professor Allen Thomas’s Geshikhte fun di fareynigte shtaaten (History of the United States) (New York: Jewish Press Publishing Company, 1912), 2 volumes, with the English original and supplements entitled: “Explanation of Independence” and “The Constitution of the United States,” among others. He also played a role in the trade union movement for Jewish writers, serving several terms as president of the Y. L. Perets writers’ association. He died in New York. Sources: Zalmen Reyzen, Leksikon, vol. 2, with a bibliography; Zalmen Zilbertsvayg, Leksikon fun yidishn teater (Handbook of the Yiddish theater), vol. 2 (New York, 1934), with a bibliography; A. Sh. Zaks, Di geshikhte fun arbeter-ring, 1892-1925 (History of the Workmen’s Circle, 1892-1925) (New York, 1925), see index; Moyshe Shtarkman, in Yivo-bleter (Vilna) 4.4-5 (1932), pp. 354-87; Y. Kopilov, Amol un shpeter (Once and later) (Vilna: Altnay, 1932), pp. 303ff; A. Tsadek, in Der tog (New York) (November 11, 1934); P. Dembitser, in Forverts (New York) (April 29, 1935); Y. Milkh, Di antshteyung fun “forverts” un zayn kamf mitn “abend blat” (1893-1902), zikhroynes (The rise of Forverts and its battle with Abend blat, 1893-1902, memoirs) (New York, 1936); Y. Khaykin, Yidishe bleter in amerike, a tsushteyer tsu der 75-yoriker geshikhte fun der yidisher prese in di fareynikte shtatn un kanade (Yiddish letters in America, a contribution to the seventy-five year history of the Yiddish press in the United States and Canada) (New York, 1946); L. Yud, in Nyu-yorker vokhnblat (New York weekly newspaper) (New York, 1947), p. 319; A. Hindes, in Folks-shtime (Lodz) (April 9, 1948); Y. Benyomen, in Yorbukh fun semeteri-department fun arbeter-ring (Annual of the Cemetery Department of the Workmen’s Circle) (New York, 1948); H. Shnayderman, obituary notice in Jewish Book Annual (New York, 1948/1949); Y. Sh. Herts, 50 yor arbeter ring (Fifty years of the Workmen’s Circle) (New York, 1950), see index; B. Ts. Goldberg, in Tog-morgn-zhurnal (New York) (November 27, 1957); Y. B. Beylin, in Morgn-frayhayt (New York) (December 15, 1957); A. Rontsh, Geklibene shriftn (Selected writings) (New York, 1960); Arbeter-ring boyer un tuer (Builders and leaders of the Workmen’s Circle), ed. Y. Yeshurin and Y. Sh. Herts (New York, 1962), pp. 281, 282; Arbeter-ring in ranglenishn un dergreykhungen, 1914-1964 (The Workmen’s Circle, its strivings and achievements, 1914-1964) (New York, 1964), pp. 65-68. The adopted name of Yitskhok Erlikhson, he was born in Wierzbnik-Strachowice, Kielce, Poland. He studied in religious primary schools and in a professional trade school. He went on to specialize in the chemical processes in producing leather and was employed in the men’s clothing industry. During the war years, he turned up in Soviet Russia, where he was arrested and sent to perform hard labor in the forests of northern Russia. After being freed from deportation, he joined the Polish army. He returned to Poland in 1944. For a time he held governmental posts aimed at establishing the leather industry. He moved to Paris in 1947 and there he began to write. He published in: Unzer vort (Our word) in Paris; Di tsayt (The times) in London; and Der amerikaner (The American) in New York; among others. His published two books: Mayne fir yor in sovet-rusland (My four years in Soviet Russia) (Paris, 1953), 296 pp. ; and Poyln nokh der bafrayung (Poland after liberation) (Paris, 1956), 166 pp. Both volumes were published with the financial assistance from the cultural division of the Joint Distribution Committee in Paris. Sources: Y. Shmulevits, in Forverts (New York) (November 24, 1953; May 8, 1956); Sh. Rozhanski, in Idishe tsaytung (Buenos Aires) (January 10, 1954); Y. Rapaport, in Di tsukunft (New York) (March 1954); D. Blits, in Naye prese (Paris) (November 6, 1954); L. Domankevitsh, in Unzer vort (Paris) (February 11, 1956); Gar and F. Fridman, Biblyografye fun yidishe bikher vegn khurbn un gvure (Bibliography of Yiddish books concerning the Holocaust and heroism) (New York, 1962), see index. He was born in Dvinsk (Dinaburg, Daugavpils), Latvia, to a merchant father who dealt in grains. He attended religious elementary school and studied in senior high school in Rovno and Libave (Liepāja), later in the Riga Polytechnic from which he was expelled in 1906 for his political activities on behalf of the Bund. In 1909 he was studying in the technical college in Dresden, Germany, before returning to Riga, where (1912) he graduated from the Polytechnic as a technical engineer. Until 1920 he worked as a construction engineer in Moscow and in Persia. His literary work began when he was still a student with Libavskie novosti (Libave news) in Russian, later publishing feature pieces and stories in the Russian Jewish Evreiskii mir (Jewish world), Razsvet (Dawn), Voskhod (Sunrise), and Budushchnost’ (Future), and in the Russian Zhurnal dlia vsikh (Journal for all). He received first prize for a story in the competition run by the journal Vesna (Spring)—the jury consisted of A. Izmaylov and Aleksandr Blok. He also contributed to Rizhskii novosti (Riga news) and edited the periodical Rizhskii kurant (Riga gazette). In Yiddish he debuted in print with a feature in Di yudishe shtime (The Jewish voice), edited by Bal-Makhshoves, in Riga. After returning to Riga from Russia in 1919, he wrote for the local Russian newspaper Sevodnya (Today). In May 1920, he and H. Urmakher began publishing the newspaper Dos folk (The people), which over the course of years was extremely popular and the only Yiddish daily in Latvia. The newspaper often changed its political direction, and the contributors twice went on strike against their bosses: November 1922 and December 1925, when all of the writers left Dos folk and helped found the new daily newspaper Frimorgn (Morning). Under such pen names as T. Dvinskii, Amoliker Yoysef, Ayin, Reb Tankhn, A Riger, A Liber, and Liles, among others, Eidus wrote for Dos folk articles, features, notices, and the like. 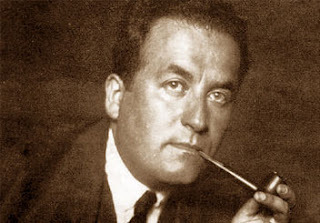 In April 1926 he and Urmakher revived publication of Dos folk under the editorship of Latski-Bertoldi and Dr. Helman. Soon thereafter, both editors moved over to Frimorgn, and once again Dos folk folded. In October of that year (1926), the newspaper was again revived, this time as the organ of the Aguda, but soon after it shut down for good. Eidus also edited Kol-boy (Catchall), a weekly newspaper of satire, humor, and literature. In 1930 he serving as editor of Riger tog (Riga day). He founded the weekly newspaper Fraytik (Friday) for which he regularly penned theater reviews. He also led a battle against the Yiddish theater association which managed the Riga State “Minorities Theater.” He also contributed to the Riga humor newspaper Der ashmodai (The Ashmodai), Kovno’s Vispe (Islet), New York’s Tog (Day), Warsaw’s Ilustrirte vokh (Illustrated week) and Literarishe bleter (Literary leaves), where he won recognition for his novella Zere avrom (Seed of Abraham) in a competition for fiction. In book form: Der brilyantener ring (The diamond ring) (Riga, 1923), 64 pp. ; Zere avrom (Riga, 1926), 166 pp. ; Der nayer id, pyese fun modernem yidishn lebn mit gezang un deklamatsye in 3 aktn un 6 bilder (The new Jew, a play of modern Jewish life with singing and declamation in three acts and six scenes) (Riga, 1938), 84 pp. In his translation there appeared Geklibene shriftn fun a. s. pushkin (Collected writings of A. S. Pushkin) (Riga, 1937), 31 pp. He also wrote a drama in four acts: Der man mit di dolarn (The man with the dollars). What happened to him during the years of WWII remains unknown. Sources: Zalmen Reyzen, Leksikon, vol. 2, with a bibliography; Zalmen Zilbertsvayg, Leksikon fun yidishn teater (Handbook of the Yiddish theater), vol. 2 (New York, 1934); M. Gerts, 25 yor yidishe prese in letland (25 years of the Yiddish press in Latvia) (Riga, 1933); Y. Rapaport, in Fray arbeter-shtime (New York) (April 8, 1955); Leksikon fun der nayer yidisher literatur (Biographical dictionary of modern Yiddish literature), vol. 2 (under the biography of M. Gerts: http://yleksikon.blogspot.com/2015/09/m-gerts.html) and vol. 4 (under the biography of Yitskhok Kharlash: http://yleksikon.blogspot.com/2017/01/yitskhok-kharlash.html). He was born in Buczacz, Galicia. Was a recipient of the Nobel Prize for Literature. In his youth he also wrote in Yiddish: a poem in Yudishes vokhenblat (Jewish weekly newspaper) in Stanislav (July 17, 1903), a story in Der yudisher veker (The Jewish alarm) in Buczacz (August 12, 1906), as well as in Dos yudishe togblat (The Jewish daily newspaper) in Lemberg and G. Bader’s Der yudisher folkskalender (The Jewish people’s calendar) in Lemberg. A longer story by Agnon from this period in his life was Der toyten-tants (The dance of death). In 1907 he made aliya to the land of Israel and wrote nothing further in Yiddish. In book form: Yidish verk (Yiddish works) (Jerusalem: Hebrew University, 1977), 56 pp. + 152 pp. Translated from Hebrew: Shriftn, in dray teyln (Writings, in three parts), trans. 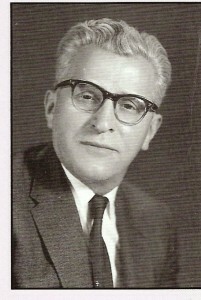 Eliezer Rubinshteyn (Tel Aviv: Hamenorah, 1969), 605 pp. ; Tsvishn alt un nay, oysderveylte dertseylungen (Between old and new, selected stories), trans. Ḥaim Gurt (Tel Aviv: Yisroel-bukh, 1978), 246 pp. He died in Reḥovot. Source: Getzel Kressel, Leksikon hasifrut haivrit (Handbook of Hebrew literature) (Merḥavya, 1967), vol. 2. Berl Kagan, comp., Leksikon fun yidish-shraybers (Biographical dictionary of Yiddish writers) (New York, 1986), col. 413. He was born in Vilna and studied in religious elementary schools and the Vilna Hebrew high school. In 1929 he made aliya to the land of Israel. He was employed in construction and agriculture. He attended a teachers’ seminary in Jerusalem. In 1932 he left for Vienna where he studied at university, participated in self-defense of Jewish students in fighting against anti-Semitism, was arrested, spent several weeks in jail, and was then deported from Austria. He then returned to Israel and took up teaching and literary work. He began writing at an early age, and he published his first Hebrew poem in Hamishtala (The [plant] nursery), a weekly brought out by the youth movement “Hakokhav” (The star) and edited by A. Luboshitski. At age seventeen he received an award from the Warsaw Yiddish illustrated journal Velt-shpigel (World mirror) for his story “Mayn ershte libe” (My first love). He also published articles in other newspapers. He contributed as well to such Hebrew periodicals as: Gilyonot (Tablets), Moznaim (Balance), Doar hayom (Today’s mail), Hadoar (The mail), Niv (Expression), Musaf ledavar (Additional words), Hamashkif (The spectator), Bitsaron (Fortress), and Baderekh (On the road). In 1940, he and Y. Arikha were editing Hadifdefet (The pad of paper), a literature book for pupils in Hebrew schools. Among his works of poetry: Behizdakekhut, shirim (Purifying, poems) (Tel Aviv: Gilyonot, 1934/1935), 169 pp. ; Beshaar hakelaya vehapele, shirim (At the gateway of the destruction and the wonder, poetry) (Tel Aviv: Gilyonot, 1938/1939), 53 pp. ; Yesh moledet leish, shirim (There is a homeland for man, poetry) (Tel Aviv: Ts. Linman, 1939/1940), 61 pp. ; Bezaaf lel, shirim (Angry at the night, poetry) (Jerusalem, 1942), 56 pp. ; Al gesher halel, shirim (On the bridge of the night, poetry) (Tel Aviv: N. Tverski, 1946/1947), 217 pp. ; in the anthology Shira ivrit (The Hebrew poem) (Tel Aviv, 1948). He died in Tel Aviv. Source: D. Tidhar, in Entsiklopedyah leḥalutse hayishuv uvonav (Encyclopedia of the pioneers and builders of the yishuv), vol. 4 (Tel Aviv, 1950), p. 1633. He was born in Borislav (Boryslaw), eastern Galicia, to poor parents. At a young age he became a laborer and was active in the Jewish labor movement. Over the years 1930-1933, he was co-editor of the Lemberg weekly newspaper Unzer veg (Our way), central organ of Labor Zionism in eastern Galicia. He spent the years WWII in the Soviet Union. In 1945 he was a member of the central committee of liberated Jews in Poland, later chairman of the district Jewish committee of Wrocław. He was a cofounder of various economic institutes, children’s homes, and Jewish public schools in Lower Silesia. Over the years 1946-1948, he was the publisher and co-editor of the newspaper Niderslezye (Lower Silesia) and Nowe życie (New life). He was director (1950-1953) of the publishing house “Yidish bukh” (Yiddish book) in Warsaw. He took part in the production of Y. l. perets zamlbukh (Y. L. Perets anthology), published by Yidish bukh in 1952. He spent the years 1954-1956 as director of a Polish publishing house in Warsaw. He also contributed work to Nay lebn (New life) and Yidishe shriftn (Yiddish writings) in Warsaw. In book form: Tsu a nay lebn, tsvey yor yidishe yishev in niderslezye (Toward a new life, two years of a Jewish settlement in Lower Silesia), with a foreword by Kh. Stolyar (Wrocław: Niderslezye, 1947), 84 pp. In 1947 he left Poland and settled in Toronto, Canada. For a short time he contributed to: Der idisher zhurnal (The Jewish journal), Canadian Jewish News, and Jewish Standard—in Toronto; and Keneder odler (Canadian eagle) in Montreal. He organized the committee to publish Who’s Who in Canadian Jewry. He was a member of the Council of the Canadian Jewish Congress and director of the United Organizations in the Histadruth campaign in Toronto. Among his pen names: Y. Barski. In 1991 he published a memoir entitled Grand Illusion (Toronto: Lugus), 175 pp. He died in Florida. Sources: A, Tsintsinatus, in Bafraytung (Lodz) 5 (October 5, 1947); Sh. L. Shnayderman, Tsṿishn shrek un hofenung, a rayze iber dem nayem poyln (Between fear and hope, a voyage through the new Poland) (Buenos Aires, 1947), pp. 272-74; Joseph Tenenbaum, In Search of a Lost People (New York, 1948); L. Arye,, in Keneder odler (Montreal) (February 5, 1950); Yanos Turkov, Nokh der bafrayung, zikhroynes (After liberation, memoirs) (Buenos Aires, 1962); Who’s Who in Canadian Jewry (Ottawa, 1964), pp. 256-58. The Hebraized surname of Yitskhok Mishkinski, he was born in Bialystok, Russian Poland. He studied in the Bialystok and Grodno yeshivas, later graduating from the Tachkemoni seminary in Warsaw. Over the years 1928-1933, he attended the Universities of Berlin and Basel, and the Hebrew University in Jerusalem. He studied philosophy, history, and literature. From 1935 he was contributing to the press in the land of Israel. In 1936 he became a member of the editorial board of Davar (Word), as well as a regular contributor to Hapoel hatsayir (The young worker), Davar hashavua (Word of the week), and Kol yisrael (Voice of Israel—formerly, Kol yerusholayim [Voice of Jerusalem]). He left Davar in 1954 and became a member of the education department of the Jewish Agency in New York. He published essays on modern Hebrew literature and cultural life in the state of Israel (in English). He placed writings in Hadoar (The mail) and had a monthly report in the journal Bitsaron (Fortress) in New York. From time to time he also contributed to Byalistoker shtime (Voice of Bialystok), Tog-morgn-zhurnal (Day-morning journal), Di tsukunft (The future), and Folk un velt (People and world)—in New York; and Keneder odler (Canadian eagle) in Montreal. He also published articles in Congress Weekly and translated into Hebrew novels, stories, and plays from English, Yiddish, German, and Polish, such as: William Saroyan, Hakomedya haenoshit (Human Comedy) (Tel Aviv: Am oved, 1945/1946), 285 pp. ; Saroyan, Mivḥar sipurim (Selected stories) (Tel Aviv: Am over, 1946/1947), 274 pp. ; Nancy Wilson Ross, Yad smol hi haḥolemet (The Left Hand Is the Dreamer) (Merḥavya, 1949), 390 pp. ; Meḥazit leḥazit (From front to front) from English; Howard Smith, Barakevet haaḥarona miberlin (Last Train from Berlin) (Tel Aviv: Ts. Lainman, 1943), 243 pp. ; Quentin Reynolds, Hapetsuim lo zaaku (The Wounded Don’t Cry) (Tel Aviv: Ts. Lainman, 1941/1942), 226 pp. ; and stories by Stefan Zweig, Arthur Schnitzler, Dorothy Parker, Damon Runyon, and Mark Twain, among others. He also contributed to anthologies for Hadoar, Davar, and Aḥdut avoda (The unity of labor), among others. Using the pen name Y. Mishal, he published in English a pamphlet entitled Zionist (New York: Hadassah). He was a member of the Agudat Hasofrim (Association of [Hebrew] writers) in the state of Israel, of the Tel Aviv journalists’ association, and of the Y. L. Perets writers’ association. Among his pseudonyms: Y. Ben-Taakov, Tsvi, Tsofe, Y. Ḥuker, Avi-Yaakov, Avi-Benyamin, and Politikum. In early December 1964 he was severely injured in an automobile in New Brunswick, New Jersey. He was among the most important Hebrew journalists for issues of the day, both Jewish and general, and after settling in the United States he carved out an honored place in Yiddish journalism as well. His translations from other languages enriched Hebrew literature not only with works from world literature, but they also contributed to the enrichment of modern Hebrew stylistics. He translated into Hebrew Sh. Berlinski’s A lebn geyt oyf (A life arises) (Warsaw, 1937) under the title Beshaḥar ḥayim (Life at dawn) (Tel Aviv: Am oved, 1950), 191 pp. He edited the collection Yalkut lehumor velesatira, misifrut haolam umisifrut idish (Collection of humor and satire, from world literature and from Yiddish literature) (Tel Aviv: Sh. Shreberk, 1950), 310 pp., in which the translations were mostly his own. He also translated for Habima [the Hebrew theater company] Arthur Miller’s drama Moto shel sokhen (Death of a Salesman) (Tel Aviv, 1951) and R. C. Sherriff’s Mis meibl (Miss Mabel) (Tel Aviv, 1950). He also contributed to Sefer hashana shel haitonim (Newspaper yearbook) in Tel Aviv. He was a press official for the United Jewish Appeal. Sources: D. Tidhar, in Entsiklopedyah leḥalutse hayishuv uvonav (Encyclopedia of the pioneers and builders of the yishuv), vol. 4 (Tel Aviv, 1950), p. 2017; Dov Sadan, Kearat egozim o elef bediha ubediha, asufat homor be-yisrael (A bowl of nuts or one thousand and one jokes, an anthology of humor in Israel) (Tel Aviv, 1953). He was born in Ostrolenke (Ostrołęka), Lomzhe district, Russian Poland. He studied with his father (a scholar who had rabbinical ordination), in religious primary school, and in the Lomzhe yeshiva. At age six he was already demonstrating acting talent, and at sixteen he ran away from home to be able to act in the theater. During WWI (1915), he made his way with his parents to Lomzhe and began writing poetry there. His first poem, “Dos fidele veynt” (The fiddle cries), written when he was fourteen, later appeared in one of his volumes of poetry. In 1928 his poetry was published in Velt-shpigl (Mirror of the world) in Warsaw. From 1926 he appeared on stages in a variety of provincial theaters in plays by Perets Hirshbeyn, Avrom Goldfaden, Yankev Gordin, and others. In 1932 he made his way to the United States and became a contributor to Davar (Word). A portion of his poems that were translated into Hebrew were published in Davar, Ketuvim (Writings), and Bemaale (On the way up) in Israel. His original Yiddish poems were published in the Warsaw Yiddish-language newspapers: Moment (moment), Dos vort (The word), and Letste nayes (Latest news), among others. His published books include: A bikhl lider (A little book of poems) (Vilna, 1931), 48 pp. ; Ben dam ledam, shire shekia vetoḥelet (Between blood and blood, songs of sunset and feast) (Tel Aviv: Yavne, 1939), 53 pp., poems about the war; Beterem yom, shirim beivrit uveidish (Before the day, poems in Hebrew and in Yiddish) (Tel Aviv, 1952), 107 pp., in the preface to which, the author writes: “This time I am providing both Hebrew and Yiddish poems, as a symbol of the wonderful bridges on which the survivor walks and as a remembrance of the destroyed diaspora.” He also edited the remembrance volume Sefer kehilat ostrolenka (Volume for the community of Ostrołęka), in both Hebrew and Yiddish (Tel Aviv, 1963), 580 pp., in which he included several pieces of his own work. He was a member of ACUM (The Society of Authors, Composers and Music Publishers in Israel) and of the association of writers and artists. He was last living in the state of Israel. Sources: “Naye bikher” (New books), Literarishe bleter (Warsaw) (October 2, 1931); Mr., “Poetn-poetn” (Poets-poets), Vokhnshrift far literatur (Warsaw) (November 11, 1932); D. Tidhar, in Entsiklopedyah leḥalutse hayishuv uvonav (Encyclopedia of the pioneers and builders of the yishuv), vol. 6 (Tel Aviv, 1955), pp. 2540-41; Sh. Margoles, in Bukh fun ostrolenker kehile (Book of the Jewish community of Ostrołęka) (Tel Aviv, 1963), pp. 100-1; Y. Shmulevitsh, in Forverts (New York) (March 15, 1964). He was born in Vilkovishk (Vilkaviškis), Lithuania. He studied in religious elementary school and yeshiva. He graduated from a Russian high school. In 1923 he immigrated to Canada. He studied music and worked as a music teacher. He was the author of Zing mayn lid, lider un poemen (Sing my song, songs and poems) (Montreal, 1984), 178 pp. He died in Montreal. He was born in Mohilev (Mogilev), Byelorussia. He studied in religious elementary school and with private tutors. In 1897 he graduated from the Mogilev high school, and in 1902 from the University of Paris as a doctor of law. In Paris he turned to practicing as an attorney as well as to writing. At the sixth Zionist congress, he was opposed to the Uganda project and represented Labor Zionism. In 1903 he founded the first Labor Zionist organization in Paris. 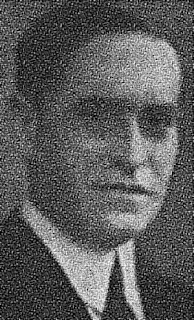 In 1920 he represented the Parisian “snif” (branch) of the Labor Zionists at the world Labor Zionist conference in Vienna. He also served as secretary of the Russian Jewish Zionist student association in Paris. When the Germans occupied France in 1940, he went into hiding and later left for Switzerland (his wife and daughter, in 1944, were sent by the Germans to Auschwitz and murdered there). In 1945 he made his way to Israel and published in Davar (Word) articles about France. In 1948 the publishing house of Alexander Mozes in Tel Aviv published his book in Hebrew: Et asher raiti (What I saw), 126 pp., the author’s diary from the years 1944-1946, with a preface by Y. Zerubavel. He contributed to: Evreiskaia zhizn’ (Jewish life) and Razsvet (Dawn); Écho sioniste (Zionist echo) and other French Jewish publications; in Hebrew to Davar, Al hamishmar (On guard), and Laaḥdut haavoda (For the union of labor); and in Yiddish to Nay-velt (New world) and other serials in Israel. He translated books and pamphlets from Hebrew into French. His books would include: Nakanune vozrozhdeniia, vpechatleniia poezdki po okkupirovannoi Palestine (On the eve of revival, impressions of a journey to occupied Palestine) (Berlin, 1920), 148 pp. ; Juifs russes, le Bund et le Sionisme (Russian Jews, the Bund and Zionism) (Paris: Cahiers de la quinzaine Univ.-Bibliothek 1904), 154 pp. ; and Les Juifs d’aujourd’hui (Jews today) (Paris: Rieder, 1927), 216 pp. ; among others. He was last living in the state of Israel. Sources: M. Anyutin [Marc Jarblum], in Parizer haynt (Paris) 569 (1927); D. Tidhar, in Entsiklopedyah leḥalutse hayishuv uvonav (Encyclopedia of the pioneers and builders of the yishuv), vol. 4 (Tel Aviv, 1950), pp. 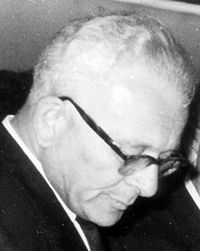 2002-3; Noyekh Grim, in Nay-velt (Tel Aviv) 51 (1948). He was born in Czernowitz, Bukovina. He studied in religious elementary school, in a community public school, and later in a German state high school. He was active in Ḥoveve-tsiyon (Lovers of Zion). He was a cofounder of the Hasmonean society among Jewish students. In 1891 he entered Czernowitz University and became a regular contributor to Dr. Nosn Birnboym’s (Nathan Birnbaum’s) newspaper Selbstemanzipation (Auto-emancipation). After graduated from the law faculty of the university, he practiced as an attorney in Czernowitz. He served as a delegate to the first Zionist congress and was selected onto the first “Action committee.” He was also a delegate to practically all subsequent Zionist congresses. He wrote for Herzl’s central weekly newspaper Die Welt (The world). When the Russians occupied Czernowitz during WWI, he was deported to Siberia, from whence he was freed following the intervention of the Austrian government in 1917. After moving to Vienna, he published his memoirs of Siberian captivity in Die Zeit (The times) and Jüdische Zeitung (Jewish newspaper). In 1918 he was selected to serve as president of the council of Bukovina Jewry. In 1919 he founded and edited Ostjüdische Zeitung (Eastern Jewish newspaper) in Czernowitz. He also participated in the founding conference of the World Jewish Congress. In 1926 he was elected to the Romanian parliament, where he fought bitterly against Romanian anti-Semitism. He was selected onto the Romanian senate in 1928. In 1930 he helped to establish a general Jewish party in Romania. On his sixtieth birthday in 1932, the Czernowitz city council decided to name a street after him. Ebner visited the land of Israel six times and settled there in 1940. He wrote in Yiddish, Hebrew, English, and German. He placed work in: Haolam (The world), Haarets (The land), Davar (Word), Yediot maariv (News of the West), Yediot hayom (News today) in German—in Israel; Di tsienistishe shtime (The Zionist voice) in Paris; Dos idishe folk (The Jewish people) and Idisher kemfer (Jewish fighter) in New York; and Tsienistshe bleter (Zionist pages) in Tel Aviv; among others. He died in Givatayim in the state of Israel. Sources: Universal Jewish Encyclopedia, vol. 3 (New York, 1941), p. 620; L. Shpizman, in Idisher kemfer (New York) (Rosh Hashana issue, 1956); D. Tidhar, in Entsiklopedyah leḥalutse hayishuv uvonav (Encyclopedia of the pioneers and builders of the yishuv), vol. 4 (Tel Aviv, 1950), pp. 1648-59; P. Shteynvak, Tsienistn (Zionists) (Buenos Aires, 1960), p. 249; A. Alperin, in Tog-morgn-zhurnal (New York) (December 17, 1955). The wife of Arkadi Kremer, she was born in Vilna. She received a Jewish education. She graduated from high school in Vilna and Vizhinsky’s dental school in St. Petersburg. At age fifteen she became active in the community. After returning to Vilna, she joined the social democratic center (1889). In 1894 she was arrested, spent a short time in the Vilna jail, and was later sent to Chaussy (Chavusy), Mogilev district, for five years. There she founded a literary group to aid the socialist press. She penned several articles for the illegal Arbayter shtime (Workers’ voice). Together with Arkadi, she co-authored the pamphlet Arbetsteg (Work days). In 1898 she traveled to Kovno, where she took part in the second Bundist congress. In 1902 she fled from Chavusy and wandered through the world (England, the United States, Switzerland). She returned to Vilna in 1921. She was employed as a proofreader by the Vilna publisher B. Kletskin. She published memoirs in Arkadi-zamlbukh (Arkadi anthology) (Vilna, 1939), pp. 22-42. She also penned a preface to the pamphlet Di skhires (Wages) by Shmuel Gozhanski. She would also have written poetry. She lived under the Soviet occupation of Vilna. 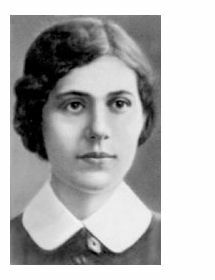 After the entrance of the Germans into Vilna, she was “di neshome fun bund” (the soul of the Bund) in the Vilna ghetto. She remained courageous, aided her friends in danger, and contributed to all the cultural activities in the ghetto. In September 1943 (roughly the 22nd-23rd), she departed on the final road to her death. Sources: Ab. Cahan, Bleter fun mayn leyn (Pages from my life), vol. 4 (Vilna, 1928), p. 416; L. Martov, in Vilne (Vilna), anthology, ed. Y. Yeshurin (New York, 1935), see index; Historishe shriftn (YIVO, Vilna-Paris) 3 (1939), p. 598; Kh. Sh. Kazdan, in Der veker (New York) (August 1, 1945); John Mill, Pyonern un boyer (Pioneers and builders) vol. 1 (New York, 1946), pp. 78, 79, 83; Mill, in Doyres bundistn (Generations of Bundists), vol. 1 (New York, 1956), pp. 130-37; Hela Klyatshko, in In di yorn fun yidishn khurbn (In the years of the Jewish Holocaust) (New York, 1948), pp. 323, 348; Dina Abramowicz, in Lite (Lithuania), vol. 1 (New York, 1951), p. 1674; F. Kurski, Gezamlte shriftn (Collected works) (New York, 1952), see index; Di geshikhte fun bund (The history of the Bund) (New York, 1960), pp. 58-60, 73, 98, 111; Herman Kruk, Togbukh fun vilner geto (Diary from the Vilna ghetto) (New York, 1961), pp. 36, 43. He was born in Shedlets (Siedlce), the younger brother of Yitskhok Kaspi. His father Khayim Yoysef, a businessman, gave him a traditional and, at the same time, a secular education. From his youth he was active in Zionist work, as well as in the “Hashomer hadati” (The religious guard) movement. He was secretary of the local united Jewish National Fund commission. He was a cofounder and secretary of the Yavne school in Siedlce. Over the years 1936-1939, he published articles in Shedletser vokhenblat (Siedlce weekly newspaper). He contributed as well to the Mizrachi press in Poland. He was active in the community and cultural life of the Siedlce ghetto. He was murdered in the gas chambers of Treblinka. Source: Information from Yitskhok Kaspi in New York. He was born in the town of Novouzhitse (? ), Kamenets-Podolsk, Ukraine. He studied in the town of Khust, Hungary [now, Ukraine], in the yeshiva of Rabbi Moyshe ben Amrom Grinvald, the author of Arugat habosem (The bed of flowers). He spent many years at the court and the synagogue house of study of the Husatiner Rebbe, and he later studied in Odessa in the rabbinical seminary of Rav Tzair [Ḥaim Tshernovits]. He arrived in the United States in 1910 with the task of performing ritual slaughtering and ordaining rabbis. He endured great hardships in settling in, and a short time later became a highly successful businessman. He was active in the Jewish National Labor Alliance and the Jewish public schools. He was a cofounder of both the Knesses day schools in Brooklyn and the Bronx. In 1945 he founded the “A. Sklarin Matones Fund” to distribute stipends and prizes for the best students and graduates of the Knesses day schools and middle schools in the Zionist labor movement. For many years he collected Yiddish folk expressions, jokes, and anecdotes and from time to time published them in the daily Yiddish press. In book form, he published: Toyznt un eyns, vitsn anekdotn un mayselekh (1001, jokes, anecdotes, and stories), with a preface and a foreword by Y. M. Biderman (New York: A. Sklarin Matones Fund, 1958), 408 pp. He was last living in New York. Sources: Y. M. Biderman, foreword to Sklarin’s Toyznt un eyns (New York, 1958); D. Segal, in Forverts (New York) (May 12, 1958); Tog-morgn-zhurnal (New York) (July 20, 1958). He was born in Lodz, Poland. He studied in religious elementary school and later in a public school. From 1928 he was active in political life, initially in the Communist youth movement, later in the Labor Zionist-Hitaḥdut (Unity) party. He was imprisoned in Polish jails for a long period of time. From 1937 he was in Paris, serving as secretary of the Parisian organization of the Labor Zionists. During WWII he volunteered to serve in the French army, was wounded in fighting against the Germans, and fell into German captivity. After the war he was a cofounder and central committee member of the Jewish combatants’ association and a member of the executive of the Jewish writers and journalists’ association in France and a regular contributor to Unzer vort (Our word) in Paris, in which he published literary essays, political articles, and reportage pieces. He placed work in: both the first and second issues of the Almanakh (Almanac) of the Jewish writers’ association in Paris, Unzer kiem (Our existence), and Der triko-fabrikant (The tights factory) in Paris; Di naye tsayt (The new times) in Buenos Aires; Ilustrirte vokh (Illustrated week) in Tel Aviv; and Di yidishe post (The Jewish mail) in Melbourne; among others. He was the author of a pamphlet concerning Khrushchev’s flattery of Stalin (Paris, 1962), 16 pp. He also published under such pen names as: A. Uri and Alef Samekh. He was last living in Paris. He was born in the town of Pitshayev (Pochayiv), Volhynia. During WWI (while he was still a child), he was evacuated with his parents to central Russia. Just after the war they returned home, and he was soon attending religious elementary school. He also studied in a state school. He later attended the Vilna Hebrew teachers’ seminary (run by Dr. Sh. Y. Tsharno). In 1933 he received his teacher’s diploma and left Vilna. In 1939 he again came to Vilna and was active in Zionist work. In 1941 he made his way, via Russia and Turkey, to the land of Israel and became a teacher in the Ben-Yehuda high school in Tel Aviv. After the Holocaust he wrote a long poem concerning the town of Pochayiv entitled: “Nishto shoyn s’shtetl” (This town is no more), published in Pitshayever yizker-bukh (Remembrance volume for Pochayiv) (Philadelphia, 1960), pp. 143-88. He also placed an article there concerning his fellow local Charles Zalts. He later published in Hebrew a series of volumes of poetry, such as: Ben habetarim (Among the Betar members) (Tel Aviv, 1942), 119 pp. ; and Ashira lakh, tel-aviv (I shall sing to you, Tel Aviv) (Tel Aviv, 1946/1947), 97 pp., (Jerusalem, 2002/2003), 95 pp. ; among others. He also translated into Hebrew poems by Adam Mickiewicz. He died in Ramat Gan. He came from a town in Poland. By trade he was a cobbler. In Warsaw’s Folks-shtime (Voice of the people) (August 1956), he published in installments a long story entitled Ester (Esther), a description of Polish Jewish life in a small town on the eve of WWII. He lived in Lodz, Poland, where he worked in a shoemaking workshop. Source: Folks-shtime (Warsaw) (August 11, 1956). He was born in Skud (Skuodas), Lithuania, and worked as a cantor. He composed songs which were sung in Lithuania but never published. Only two poems—“Shir vos er hot gezogt koydem yom hamise mit ruder yisroelke skuder” (A poem he enunciated for the first time on the day of his death with Ruder Yisroelke from Skuodas) and “Shiker-lidl” (Drinking ditty)—were published by Daniel Perski in Yivo-bleter (Pages from YIVO) (New York) 17.2 (1946), pp. 402-4. In the first poem (forty-four lines, excluding the refrain), there is a sense of remorse running through it for why he never in his life attached any important to good deeds and will have nothing to take with him into the next world. Most of the lines have an immediate folk quality, with associated, individually tragic senses of his premature, coming death. The second poem is a cheerful-sad song to a glass of wine, for which he would run “even into a dark mine.” There were two different tunes for the first poem, and for the second poem one. The musical notation may be found in Yivo-bleter, in an article by Khane Gordon: 18.2 (1946), pp. 411-12. Further biographical information remains unknown. Sources: D. Perski, in Yivo-bleter (New York) 27.2 (1946), pp. 304-9; Khane Gordon, in Yivo-bleter 28.2 (1946), pp. 411-13. A Yiddish folklorist in the Soviet Union and a collector and researcher of Jewish folklore and poetry. He was born in Zhitomir, Ukraine. He graduated from a Jewish work school in 1922 and from the Kiev Jewish pedagogical technicum in 1926. He then became a teacher of Yiddish language and literature in Kiev schools. In 1929 he joined the ethnographic section of the Kiev institute for Jewish culture in the Ukrainian Academy of Sciences as a research student. From 1931 he was a scholarly contributor to the institute, and he joined expeditions to the towns in Ukraine to collect and publish a folklore collection. In Tsaytshrift (Periodical) (Minsk) 5 (1931), he published a piece entitled “Vegn folks-iberarbetunger fun gotlobers lider” (On popular revisions of Gotlober’s poetry). In the anthology Problemen fun folkloristik (Issues in folkloristics) (Kharkov-Kiev) of 1932, he placed “Vegn folklorishn arbeter-lid” (On folkloric workers’ poems). 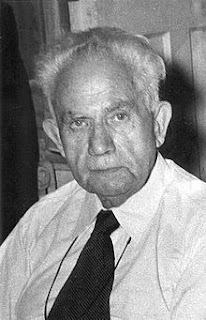 He also contributed to the quarterly journal, Visnshaft un revolutsye (Science and revolution) (Kiev) 2.6 (April-June 1935), with an essay: “Vegn ukrainishe virkungen in der yidishn folklor-lid” (On Ukrainian influences on the Jewish folkloric poem). He translated S. Grigor’ev’s Tonkes tank (Tonke’s tank [original Ton’kin tank]) (Kiev: Kultur-lige, 1930), 27 pp., and V. Vladimirskii’s A kop in shtaygl, dertseylungen fun lebn in mayrev-ukraine (Head in a cage, stories of life in Western Ukraine) (Kiev: Kultur-lige, 1930), 47 pp. In the anthology Folklor-lider, naye materyaln zamlung (Folkloric poetry, new material collection), edited by M. Viner, Skuditski prepared the poems for publication and wrote an introduction and annotations (Moscow: Emes, 1933), 142 pp. In book form, he also published: A khaver in shlakht (A comrade in battle) (Kharkov-Kiev: State publishers for national minorities, 1934), 54 pp. In the second volume of Folklor-lider, he penned the preface (80 pp.) (Moscow: Emes, 1936), 392 pp. Together with A. Velednitski, he compiled Literarishe khrestomatye, farn VI klas fun der mitlshul (Literary reader, for the sixth school year in middle school) (Kharkov-Kiev: State publishers for national minorities, 1933), 230 pp., second improved edition (Kharkov-Kiev, 1934), 280 pp. He also compiled the reader Literatur (Literature), second improved edition (Kharkov-Kiev, 1934), 124 pp., third edition (1935), 124 pp., fourth edition (1936), 130 pp. In 1937 he was purged together with a number of other contributors at the institute and exiled to a camp in the north. He was rehabilitated in the 1950s and lived in Sverdlovsk. Sources: Sh. 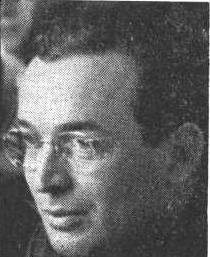 Z. Fife, in Yivo-bleter (Vilna) (14.3-4 (March-April 1939); Kalmen Marmor, Dovid edelshtat (Dovid Edelshtat) (New York, 1942); Chone Shmeruk, comp., Pirsumim yehudiim babrit-hamoatsot, 1917-1961 (Jewish publications in the Soviet Union, 1917-1961) (Jerusalem, 1961), see index.